Located just outside Laveno on the east side of Lake Maggiore, Bellezza del Lago is a gracious lakeside villa with remarkable views and a private panoramic swimming pool. Set in a 5 ½ acre natural park with century old trees, the villa is surrounded by a large grass lawn and a lovely garden. A path through the trees leads to the lake and a private beach. The main villa comfortably accommodates 10 people in 6 bedrooms with 6 bathrooms. Upon request and for an additional fee, an additional bedroom can be made available for an extra 1 or 2 people. On the same property there is another accommodation for 4 people, Carina del Lago. This was formerly the guardian’s house and is located at the entrance of the estate about 60 meters from the villa. The cottage does not face the villa garden or pool. Also featured in our catalog, Carina del Lago can be rented separately or together with Bellezza del Lago. Please see Bellezza Grande for the combined property. Together, the two properties accommodate 14 to 16 people and provide a perfect place for a large family or gathering of friends! Please note that guests renting only Carina del Lago have a separate pool, and are not allowed access to the Bellezza del Lago swimming pool or the villa’s private beach (pebble) and have their own private area of the garden. The Laveno public beach is also pebble and is about five minutes away by foot. 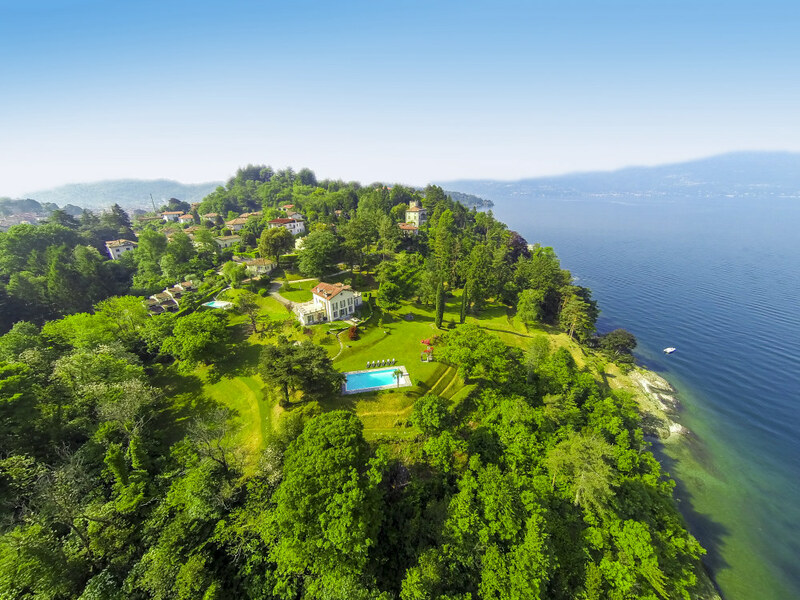 The villa estate is located directly on the waterfront near Laveno, a lively town on the eastern shore of Lake Maggiore. The wooded park surrounding the villa is a spacious 22,000 square meters. The property has direct access to the water through its 150 meters private lake shore. (Please note that Italian law allows for private beaches to be accessed by other boats from the lake). The location of Bellezza del Lago is particularly quiet and peaceful given the fact that it is located at the end of a dead end road. It is approximately 15 minutes by foot from Laveno. Laveno is a small and relaxed tourist town offering a variety of services such as grocery stores, bank, pharmacy, post office, shops, restaurants, and a lakeside promenade. There is a ferry stop in Laveno and boats go to the western side of the lake (Stresa, Pallanza, Cannero) and also to the Borromean islands, famous for their charming beauty. The Laveno Mombello train station in Laveno is about 1.5 km from Bellezza del Lago. From here trains go to the Milano Cadorna train in the center of Milano in less than one hour. The fast train from Malpensa airport goes to the Milano Cadorna train station so it is possible to fly into Malpensa and take a train to Milan and then to the villa. A handy taxi ride to the villa would be necessary with luggage. Once at the villa, day trips in the region can be made by taxi, bus or boat. As a result, Bellezza del Lago can be well suited for those who do not wish to rent a car. Bellezza del Lago was built in 1930 for a well-known Italian family and is spacious and full of atmosphere. The Italian classic style features marble tables, decorated wallpaper and furniture that was designed and hand crafted for the villa. Most rooms overlook the lake and the rooms on the ground floor have direct access to the terraces and gardens. The extensive grounds are interspersed with footpaths and views overlooking the green lawn, the park and the lake. The snowcapped mountains in the distance are stunning. A path of about 150 stone steps leads down to the lake and to the pebble beach. Please note that this path is fairly steep and could be unsuitable for elderly people or people with walking difficulties. The large swimming pool (6m x 14m) with diving board has a separate room with shower and toilet. The villa is provided with garden furniture and has ample outdoor parking space. The house measures 460 square meters (about 5000 sq ft) in size and presents a very fitting floor plan that allows families and groups separate and private sleeping quarters and also inviting common areas that the group can enjoy together. Our offering for 10 people includes: three double bedrooms with queen beds, one twin bedded room, two single bedrooms. The six bathrooms are equipped with bathtub or shower, washbasin, toilet and bidet. Please note: Only upon request when booking and upon approval of the owner 1 - 2 extra guests can be considered. In this case, an additional double bedroom on the top floor is made available for a cost of Euros 400 Euros per week, paid at arrival. All bedrooms have portable fans. Other amenities include WIFI internet (included in the price), barbecue, table tennis, VCR, stereo, CD player, satellite TV and fireplace. A telephone is not available. Bed and bath linens are changed on Wednesday and Saturday; pool towels are included and maid service is included (three hours on Wednesday; also on Saturday for rentals longer than one week). A buoy for one boat is conveniently located 25 meters from the shore and is available at the renter's own risk if the renter accepts full responsibility for its use. The buoy can be used during daytime only and in fair weather conditions. Contact details of Porto Labiene in Laveno or Cantiere Costantini in Reno can be provided as an alternative. From October 1 to April 30 there is a charge for gas used for heating and hot water. Gas used for cooking is always included. Large entrance hall with a spacious stairway, large living room with double sitting area and a marble fire place and French doors opening to the garden. Kitchen with large dining table for 12 people with French doors opening to the garden, dining room for 6 people with French doors, connecting room. The kitchen is fully equipped with a 4 hob gas stove, refrigerator with freezer, American coffee machine, Espresso coffee maker, oven, microwave, dishwasher. A washing machine and dryer are located in a storage room accessible from the garden. One double bedroom with French doors leading to a terrace and to the garden; adjacent bathroom with bathtub, one single bedroom, one small room with a baby bed, one bathroom with shower. There are 21 steps to the first floor. One double bedroom with adjacent bathroom with double sink and bathtub, one double bedroom with washbasin, one single bedroom, one bathroom with shower, storage room, and stairs to the second floor (these stairs are very narrow, 60cm). All bedrooms have direct entrance to two large terraces through French doors. One twin bedroom, two bathrooms (one with bath tub and showerhead and the other with shower) with shower, storage room. Please note that the décor on this floor is very simple. Additional bedroom for extra charge is located on this floor. The villa is about 15 minutes walking distance from the center of Laveno. Laveno is a small and relaxed tourist town with most shopping facilities, many restaurants, a promenade and where many activities are organized throughout the year. There is a ferry berth in Laveno to the western side of the lake and to the Borromean islands. A variety of water sports are possible such as parasailing and delta flying. Also within walking distance is the gondola which climbs up the hill against which Laveno is built. Cycling is popular and there is a riding school in the nearby village. 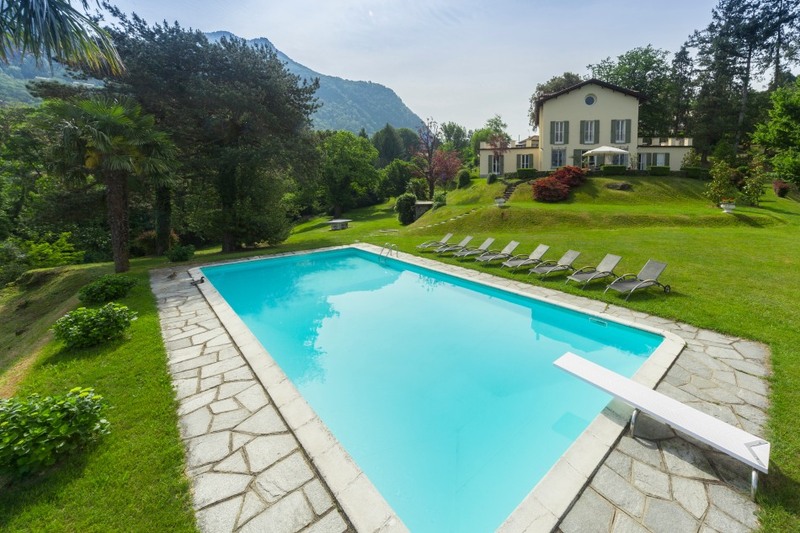 This location is also ideal for excursions to Lugano and other points in Switzerland. We recommend the high quality lunches and dinners which can be served on request. The dishes are prepared by the villa's experienced chef and service is included. A fine selection of wine can be ordered in advance or upon arrival. Please contact us for details. Bed and bath linen: Changed on Wednesday and Saturday. Maid service included: Three hours on Wednesday. Also on Saturday for rentals longer than one week. Utilities and heating: Electricity included. From Oct 1 to April 30 gas for heating and hot water is metered and charged according to usage (gas used for cooking is included). Late arrival and early departure: Upon request and approval of the owner a late arrival is possible between 7:00pm and 9:00pm for an extra fee of 50 Euros. It is also possible to have an early departure before 8:00am for an extra fee of 50 Euros. For 11- 12 guests, please add Euros 400 Euros per week, paid at arrival. Varese and Milano are less than an hour away by train or car. Angera with its Borromeo Castle is a 30 minute drive as is as the romantic Sanctuary of Santa Caterina del Sasso.